Applied Spatial Cognition illustrates the vital link between research and application in spatial cognition. With an impressive vista ranging from applied research to applications of cognitive technology, this volume presents the work of individuals from a wide range of disciplines and research areas, including psychologists, geographers, information scientists, computer scientists, cognitive scientists, engineers, and architects. Chapters throughout the book are a testimony to the importance of basic and applied research regarding human spatial cognition and behavior in the many facets of daily life. The contents are arranged into three sections, the first of which deals with a variety of spatial problems in real-world settings. The second section focuses on spatial cognition in specific populations. The final part is concerned principally with applications of spatial cognitive research and the development of cognitive technology. 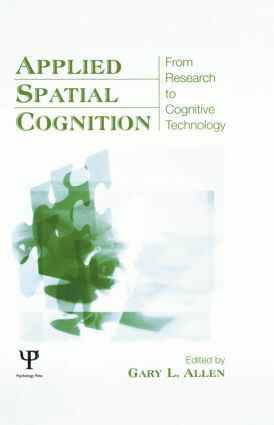 Relevant to a number of remarkably diverse groups, Applied Spatial Cognition will be of considerable interest to researchers and professionals in industrial/organizational psychology, human factors research, and cognitive science. Contents: Preface. Part I: Influencing Spatial Activity in Real-World and Electronic Environments. T. Gärling, P. Loukopoulos, Choice of Driving Versus Walking Related to Cognitive Distance. M. Denis, P-E. Michon, A. Tom, Assisting Pedestrian Wayfinding in Urban Settings: Why References to Landmarks Are Crucial in Direction-Giving. B. Tversky, M. Agrawala, J. Heiser, P. Lee, P. Hanrahan, D. Phan, C. Stolte, M-P. Daniel, Cognitive Design Principles for Automated Generation of Visualizations. S. Bertel, G. Vrachliotis, C. Freksa, Aspect-Oriented Building Design: Towards Computer-Aided Approaches to Solving Spatial Constraint Problems in Architecture. S. Hirtle, M. Sorrows, Navigation in Electronic Environments. Part II: Assisting Wayfinding, Orientation, and Mobility in Specific Populations. N. Foreman, Spatial Cognition and Its Facilitation in Special Populations. J.M. Loomis, R.G. Golledge, R.L. Klatzky, J.R. Marston, Assisting Wayfinding in Visually Impaired Travelers. J.A. Thomson, Negotiating the Urban Traffic Environment: Pedestrian Skill Development in Young Children. Part III: Training or Facilitating Skilled Performance. J.J. Staszewski, Spatial Thinking and the Design of Landmine Detection Training. C.D. Heth, E.H. Cornell, A Geographic Information System for Managing Search for Lost Persons. M. Hegarty, M. Keehner, C. Cohen, D.R. Montello, Y. Lippa, The Role of Spatial Cognition in Medicine: Applications for Selecting and Training Professionals. S. Guerlain, Software Navigation Design. J.N. Templeman, L.E. Sibert, Immersive Simulation of Coordinated Motion in Virtual Environments: An Application to Training Small Unit Military Tactics, Techniques, and Procedures.